There are many kinds of pre-paid card in Japan. 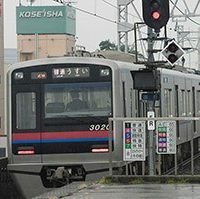 Especially, we recommend you to use “Suica” which is JR EAST’s pre-paid IC card and you can use for paying train, bus and taxi fares, as well as shopping in stores and vending machines. We guess most people, including office workers, house wives and even children in Japan know it and use it every day. A deposit of ￥500 is required when purchasing Suica, in order to prevent the cards from being thrown away. Let’s get Suica and make your trip in Japan more comfortable and enjoyable! 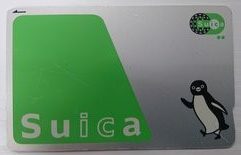 ※If you no longer need Suica, bring it back to the office. Your￥500 deposit will be refunded. ①　Touch “English” on the upper right of the screen. ② Select “Purchase new Suica”. ④　Select　your　desired amount from the options. ⑤ Insert the money into the machine. ③ Select your desired amount from the options and Insert the money. 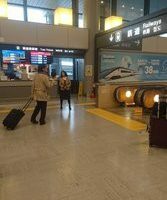 ① Touch the automatic ticket gate. 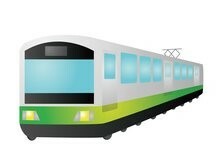 ② Get on the train. 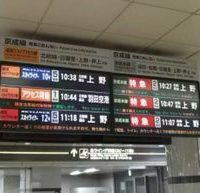 ③ At your destination, touch the automatic ticket gate again, then your fare automatically will be adjusted. ① Touch Suica panel at entrance. ② Get on the bus. 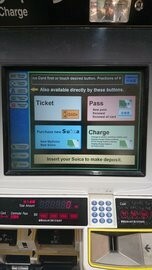 ③ At your destination, touch the Suica panel again, then your fare automatically will be adjusted. If the balance is insufficient, you can’t go through the gate. 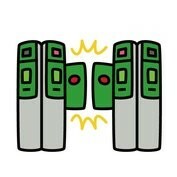 Please recharge Suica before you touch the gate. ② Touch firmly until the “Beep”. ③ You can check the receipt showing the balance. ① First, press the product button. ② The price is displayed. ③ Touch firmly until the “Beep”. ④ Take the item from compartment at the bottom.